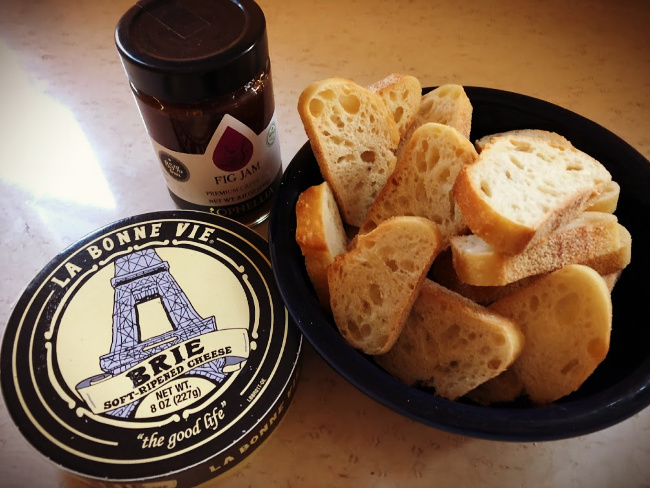 For my work holiday party I came up with an easy baguette appetizer recipe that was not just simple to make but ever so flavorful! “Easy” was the key word because our work party started immediately after school on the last day of school before winter break. So I did not have much time that day (or even during that busy week) to prep an elaborate snack to share. Initially I wanted to make to make my Baked Brie with Fig Spread and Pecans but there was not oven at the event space. So I came up with an easy baguette recipe that is similar and equally as delicious. I took the ingredients of the Baked Brie appetizer and just changed it up a little to create a tasty treat. It only took me a few minutes to whip up this easy baguette recipe. 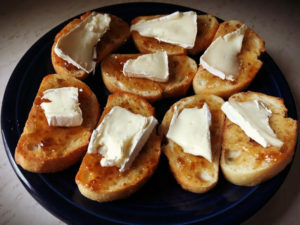 To make these, slice and toast a baguette, spread a little fig jam on the toast and then top with a sliver of sliced Brie. Voila! That’s it! I took my electric griddle to the party to toast the bread. I melted a little butter on the griddle, toasted each side and added the jam and cheese. The baguette could also be toasted in the oven or toaster oven. Or try it without toasting, that might tasty too! My sister suggested adding a little bacon, so that is next on my list of trials. I also want to try adding a slice of pear or apple to add to the flavor combinations. 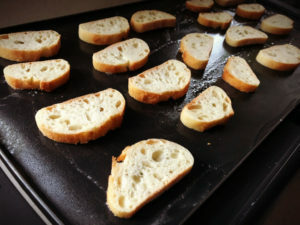 If you need an easy baguette appetizer recipe try this one at your next party! It has also become a favorite late night snack around here.